Disney fashions a modern-day icon of girl power with its animated adaptation of the 2,000-year-old Chinese folktale MULAN. When barbarous Huns attack ancient China, the fiercely independent Mulan (voiced by Ming-Na Wen) defies tradition by disguising herself as a man in order to take her ailing father's place in the Imperial Army. 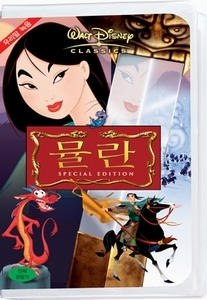 With the help of Mushu (voiced by the resilient and newly kid-friendly Eddie Murphy), a wisecracking guardian dragon sent by her ancestors for protection, Mulan trains in boot camp and then heads off to face the brutal Hun leader Shan-Yu (voiced by Miguel Ferrer)--all the while struggling to keep her gender identity a secret. Chock full of the usual Disney delights--breathtaking visuals, catchy songs, and an inspirational protagonist of courage and conviction--MULAN is a welcome addition to the studio's annals of classic animation.